Last month, we featured poet, professor, and WFMU radio host Kenneth Goldsmith singing the theory of Theodor Adorno, Sigmund Freud, and Ludwig Wittgenstein — heavy reading, to be sure, but therein lay the appeal. How differently do we approach these formidable theoretical texts, Goldsmith's project implicitly asks, if we receive them not just aurally rather than textually, but also in a light — not to say goofy — musical arrangement? 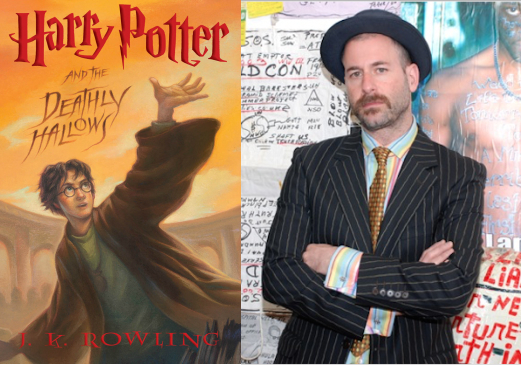 But if it should drain you to think about questions like that, even as you absorb the thought of the likes of Adorno, Freud, and Wittgenstein, might we suggest Kenneth Goldsmith singing Harry Potter? Perhaps the best-known modern exemplar of “light reading” we have, J.K. Rowling's Harry Potter books present themselves as ripe for adaptation, most notably in the form of those eight big-budget films released between 2001 and 2011. On the other end of the spectrum, with evidently no budget at all, comes Goldsmith's 30-minute adaptation, which you can hear just above, or along with his various other sung texts at Pennsound. Here he sings, with ever-shifting musical accompaniment and through some otherworldly voice processing, what sounds like the final novel in the Harry Potter series, Harry Potter and the Deathly Hallows. “She tells a good story” — thus has every adult Harry Potter-reader I know explained the appeal of Rowling's children's novels even outside of the children's demographic, especially as they awaited Deathly Hallows' release in 2007. Having never dipped into the well myself, I couldn't say for sure, but to my mind, if she tells a good enough story, that story will survive no matter the form into which you transpose it. The Potter faithful hold a variety of opinions about the degree of justice each movie does to their favorite novels, and even about the voice that reads them aloud in audiobook form, but what on Earth will they think of Goldsmith's idiosyncratic rendition? Update: Kenneth shot us an email a few minutes ago and filled out the backstory on this recording. Turns out the story is even more colorful than we first thought. He writes: "I was a DJ on WFMU from 1995-2010. In 2007, J.K. Rowling released the seventh and final Harry Potter and the Deathly Hallows. Prior to the book's release the day I went on the air at WFMU, someone had leaked a copy to the internet, enraging Scholastic Books, who threatened anybody distributing it with a heavy lawsuit. I printed out and sang in my horrible voice the very last chapter of the book on the air, thereby spoiling the finale of the series for anyone listening. During my show, the station received an angry call from Scholastic Books. It appears that their whole office was listening to WFMU that afternoon. Nothing ever came of it." No, no! Don´t want it to be the End of it! Layed down on the floor on a mohairblanket and started listening w/a smile on my face. Love that Music! Suddenly I felt like a Child. Can´t remember my parents ever read fairytales for me but now Iknow what it would feel as. Somewhere after the emerald pajamas I Went up, got a cup of hot tea and a slice of applepie and continued listening. Such a wonderful alive voice!